Cannes, as you may well know, is famous for its annual Cannes Film Festival, a major event that draws artists from around the world and sees the release of a series of independent films. Appropriately enough, the entire city is known as a resort town located on the French Riviera. The Cannes Walk of Fame is located in Palais des Festivals et des Congrès, and one of the big famous tourist attractions is Boulevard de la Croisette, which lies along a lovely beach lined with boutique shops and cafes. Below are the luxury hotels you should consider staying at when you visit this lovely city. 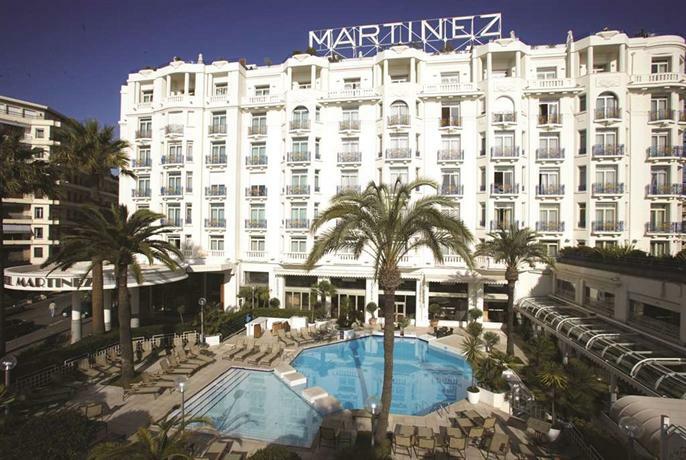 The Grand Hyatt Cannes Hotel Martinez is a five star luxury hotel located in one of the most glamorous areas in all of Cannes — the Croisette. You can look out from your rooms and feast upon the sight of the world’s most famous promenade, a great area from which to look at the lovely boutique stores and all the people carrying tiny dogs and dressed in Cavalli. This grand luxurious hotel was established in 1929 for the purposes of welcoming princes, film stars, and billionaire playboys. The Grand Hyatt places you right in the center of all the fun and games in Cannes, ideally placed to visit the Cannes Film Festival. The hotel also comes with some great amenities, such as daily yoga classes, a pool that is always heated and bubbling, and a spa that’s one square kilometer in area! If you like hanging by some beach clubs you can visit Zplage, featuring about 400 sun loungers so that you can comfortably bask under the sun. There are 409 rooms in all, and they’re all under renovation to make them look more modern, however they still intend to maintain their signature art deco aesthetics. However, you need to be careful about the rooms you select. While the most expensive rooms will offer you a grand expansive sea view, some of the cheaper rooms might leave you with a view of the Marseille-to-Nice railway line. Fun fact, the terrace of the Suite des Oliviers was used by the Absolutely Fabulous crew to host a wild party! The InterContinental Carlton Cannes is considered to be one of the best luxury five star hotels in Cannes, and is placed just a few yards from the beach. It’s located in a prime spot, towering over La Croisette, and is also quite close to the Palais-des-Festivals. The lobby of the hotel is bright and dazzling with stunning glittering chandeliers, and pristine white pillars. Historically, the Carlton has been known for its extravagant and heavy interiors, however over the years, through a series of renovations, they’ve adopted a more minimalist aesthetic, lightening up the space. One thing that bears mentioning is that the Carlton doesn’t feature a pool of its own, however it’s right across from the private beach so you probably don’t need one. As far as clientele is concerned, the Carlton is known to be home to the rich and famous. Aptly enough, the rooms in the hotel are titled ‘1950s Hollywood glamour’, but luckily enough they haven’t imbibed all the more heavy-handed aesthetics of the time, instead opting for a more natural fusion of 50s Hollywood Glamour and Contemporary Chic. The color palette favored by the hotel is beige, cream, and white, and is really quite warm and welcoming. 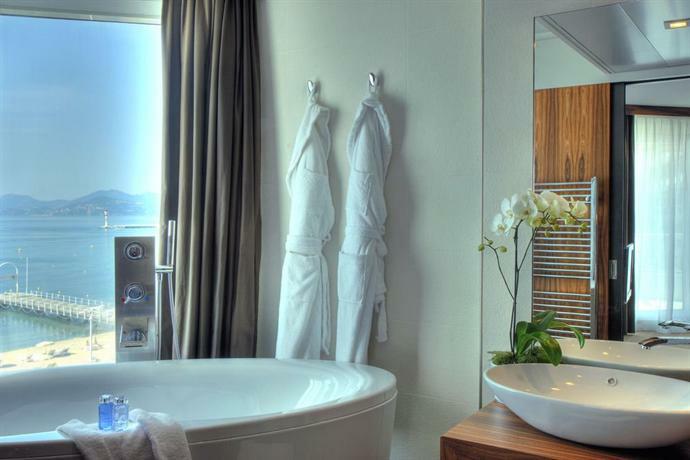 The suites in the seventh floor and above feature stunning sea views. However, if you want a view of the sea, be careful about the room you book because only a few of them offer that. One of the most fabulous things about JW Marriott Cannes is that it has a large outdoor pool alongside a gym. It’s a venue for a great many glamorous poolside parties. The outdoor pool also comes with a poolside bar which is open all day, and as such you can very well stay in all day if you so choose. As far as food is concerned, the hotel has an in-house restaurant and an in-house coffee shop, which is a great place to meet and interact with other hotel guests. This five star hotel also offers complementary free WiFi network in all the common areas. 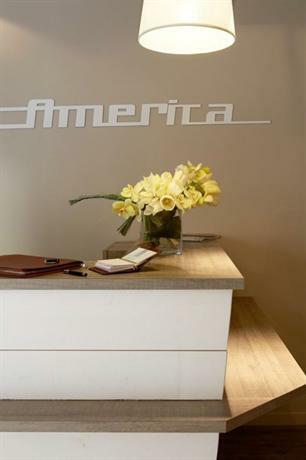 If you’re in town for business, you can also avail of their conference rooms and their limo and town car service. The conference hall is large and is often used to host several important functions all year round, with a space of 1200 square meters. In addition to all these amenities, the hotel also comes with a casino where you can try your luck, and a spa. The rooms aren’t particularly unique, aesthetically speaking, but they’re all appropriately luxurious with a great view. The Five Seas Hotel is a luxury hotel with an outdoor pool and a lovely spa where you can spend the day in complete relaxation. In addition to that, they also feature coffee shops and lounge areas where you can interact with other guests. If you’d like to eat in the hotel itself, you can avail of one of any two restaurants, both of which are flawless. Some of the other amenities offered by this luxury hotel are conference halls for people on business trips and for hosting private events, a fitness center, and even a rooftop terrace. 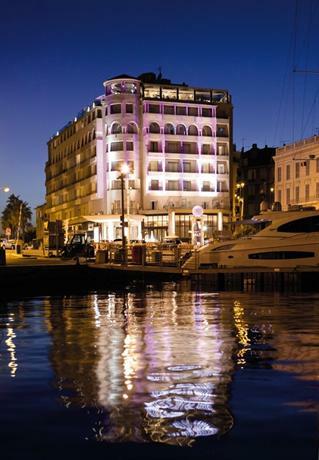 Radisson Blu 1835 Hotel & Thalasso is a luxury hotel situated in what is commonly referred to as the “heart of historic Cannes”. However, fret not because you’re still very well connected to all the prime spots of Cannes. You can reach the “Palais des Festivals et des Congrès” within 5 minutes, on foot. You’re also equidistant to la Croisette, which, as we’ve established, is one of the prime tourist attractions in the city, with one of the best shopping streets close by. 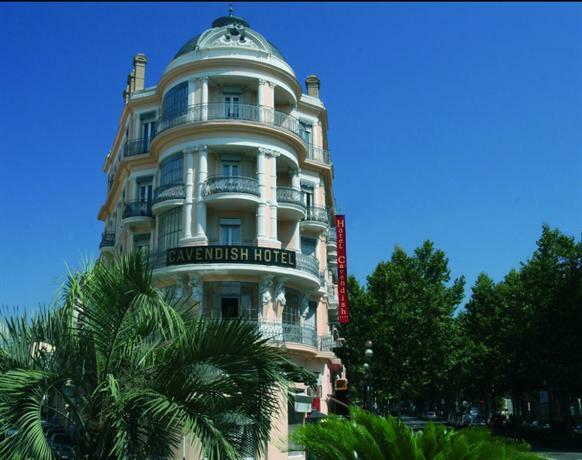 One of the prime attractions and unique factors of the Radisson hotel is that it’s attached to “Les Thermes Marins de Cannes”, which is the most famous spa in all of Cannes, with over 40 treatment cabins. If you’d like to be in a place where you can feel your worries slip away, you’re in the right place. There are 134 rooms over all, and almost all of them feature a wide expansive view of the Mediterranean sea and the Old Harbour. You also have complete access to the adjoining beach. If you climb up to the terrace, you’re also greeted with one of the most stunning sights in all of Canness — a panoramic view of the Bay of Cannes. If you're looking for some culinary delights, you can head over to the lovely restaurant called “360”, which, as the name suggests, offers a 360 degree view of the lovely city. 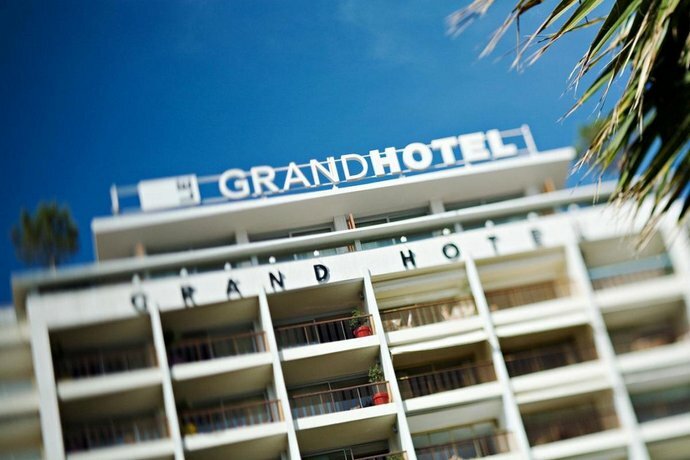 Le Grand Hotel is another well situated hotel, towering over the prime street of La Croisette, a few minutes away from the location of the Cannes Film Festival, and just across from Rue d’Antibes with all its charming boutique shops and stores. The Le Grand offers completely free high speed wireless internet connection to all the guests. The hotel also arranges a shuttle service to bring you to the hotel from the airport, and drop you back, for an additional charge. However, one thing you should be aware of regarding this hotel is that it doesn’t permit smoking. Villa Garbo is a five star luxury hotel situated just a five minute walk away from the prime attraction of Cannes — La Croisette. 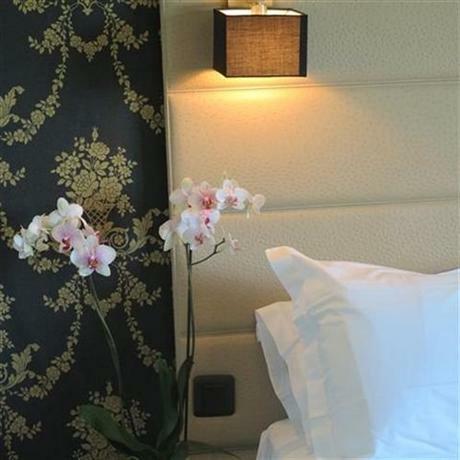 The hotel is on the lovely French Riviera and thus appropriately exudes a quiet charm and grace. Just as you leave the Villa, you enter the Rue d’Antibes street which is popular across Cannes as the shopping street replete with lovely boutique stores and cafes. Considering the fact that the villa only comes with 12 intimate suites, this is really more of a boutique hotel, ideal for people who would like a closer and more intimate setting to interact with other guests as well. The suites come with their attached fully-furnished kitchens and home theatre systems, which also makes them ideal for people who would like to stay in Cannes for an extended period, as it feels more homely. Even the bathrooms have been designed in a classy manner with sleek grey granite installments. The luxury villa also comes with private access to the La Croisette beach, and it has its own spa and a fitness center as well. The in-house bar is located on a roof terrace and it’s set off against a lovely view of the French Riviera, which makes for a truly romantic sight. As such, you can simply lounge in their bar for hours at a stretch, flanked by cooling palm trees, drinking cocktails as the sun goes down on the French Riviera. It doesn’t get much better than that. This luxury hotel is situated within the ground floor and the first floor of a series of holiday flats, and it’s located in Roquebrune-Cap Martin. A narrow road connects you to the popular pebble beach. If you’d like to visit a few other cities during your stay, you can walk over to the Carnolès railway station, and be transported to either Monaco or Nice. 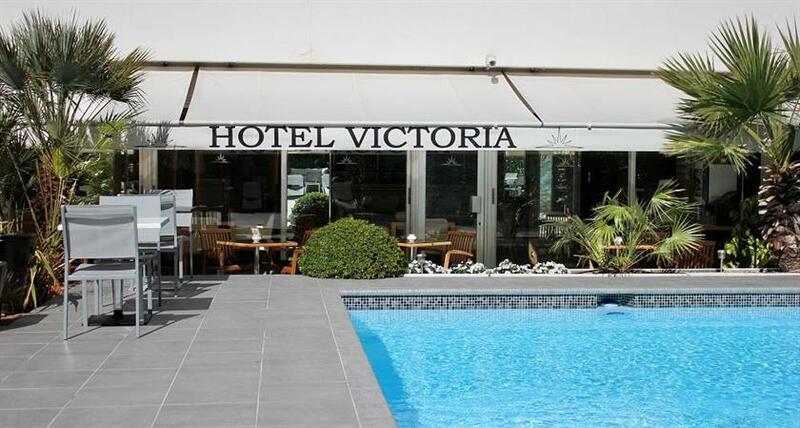 As such, even though this hotel isn’t in the vicinity of la Croisette, it’s still rather well connected in other ways. The hotel is also designed in a sleek and classy 1950s aesthetic with white leather chairs and tables, and a fabulous neon illumined bar. There are 32 rooms, and they've all been designed in an aesthetic reminiscent of the sun, sea, and the palm trees. The Hotel Le Cavendish is a luxury hotel designed in a romantic early 20th century aesthetic sense, while still featuring all the modern luxuries and comforts. The lobby also features a lovely sprawling vintage book case and a large clock, but the hotel is able to marry that vintage aesthetic with a bright and open style as well. The lift is of the metal cage kind, courtesy of yesteryears, and the salon is designed in a red and gold aesthetic. 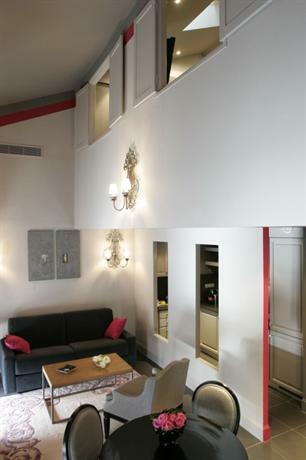 All the rooms feature their own balconies that look out into the city. 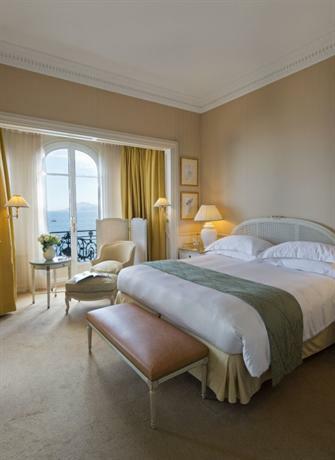 This luxury hotel is across from the Majestic hotel, and just a block away from la Croisette, and as such you can be at all the prime locations of the city in a few minutes by foot. It’s completely central and connected to the life of the city, yet just removed from it enough so as to offer you some peace and quiet. The hotel has been designed in a subtle yet elegant manner with subdued earthy colors, and a very intimate feel owing to the presence of just 28 rooms. The rooms feature a gold and brown color aesthetic. The La Villa Cannes Croisette, as the name suggests, is located smack right in the middle of la Croisette, and as such is in the midst of the life of the city. Some of its amenities are an outdoor pool with a pool bar, a grand library, and a rooftop terrace as well. If you like to be in the midst of nature, the hotel also has a charming garden you can walk amidst to seek refuge from some of the city’s more urbane attractions. All the common areas of the hotel feature complimentary high speed wireless network. The Sun Riviera is a luxury four-star hotel, however it’s also quite a lot more reasonable than the other hotels on this list. 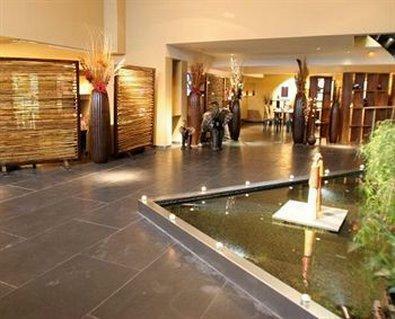 If you want luxury, but you want something less expensive, then this is the ideal hotel for you. The hotel also comes with a business center which can be used any time of the day or night. However, you should know that this hotel prohibits smoking of any kind. 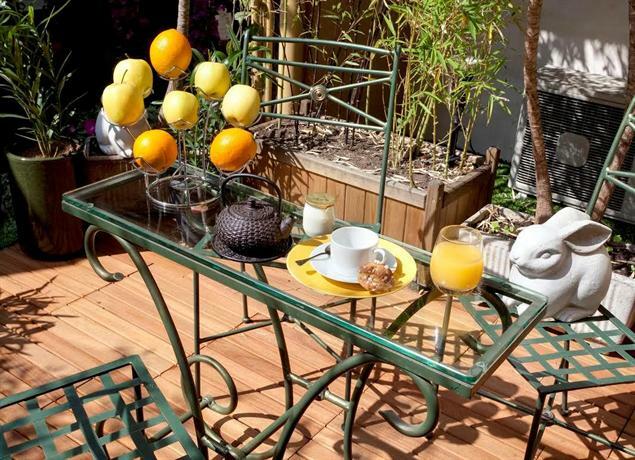 Located on Rue d’Antibes, this charming hotel is smack right in the middle of the prime shopping street of Cannes, and as such you can simply walk out of the hotel and into any one of the lovely boutique cafes and shops. 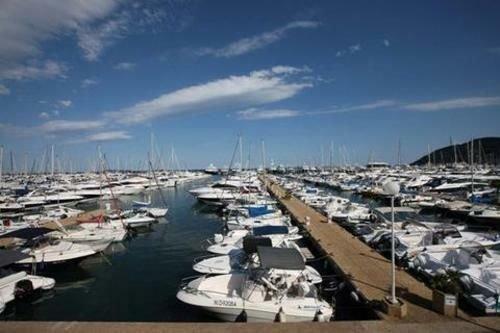 If you just walk for about five minutes you can also reach the beach and the prime attraction of Cannes - la Croisette. 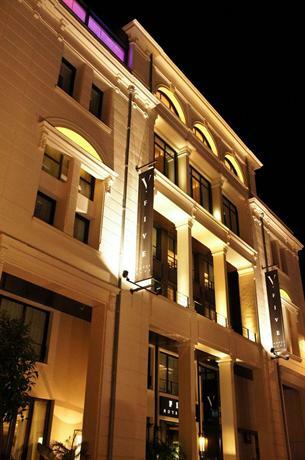 As such this hotel is centrally located, and is one of the less expensive five star hotels in the city. If you’d like to eat in the hotel, you can visit the Akwaba restaurant which serves lovely cuisines from across the globe, and has a lovely breakfast buffet as well. 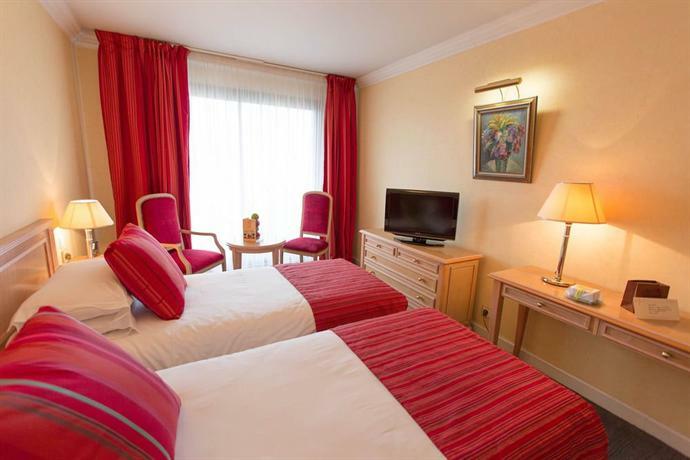 If you want to stay at a well-equipped luxury hotel but you don’t want something as expensive as all the other hotels in the list, then Hotel Colette is the perfect option for you. It’s very reasonable, offers you complimentary WiFi network, and even a pool and a poolside bar where you can while away your time. You can also ask for the hotel to prepare for a shuttle service to take you back and forth from the property. You should also know that this is a complete smoke-free property. This charming five star hotel is equipped with all the luxurious amenities such as an outdoor pool with a poolside bar where you can relax through the day, a rooftop terrace if you want to enjoy the expansive views of the city, complimentary high speed internet, and even an outdoor barbecue grill! This is more of a residential area rather than a hotel, and as such it’s a lot more intimate and is great for people who are staying at Cannes for an extended period of time.